This was in the local paper recently. And this is the final part of the fun crow poetry book, Caw! Caw! Or The Chronicle of Crows: A Tale of the Spring-time by RM, illustrated by JB. Part 4 of the lovely Caw! Caw! The Chronicle of Crows: A Tale of the Spring-time by R.M. Illustrated by JB. If you missed any, see the end of this post. Come again tomorrow for the next part of this lovely book! Caw! Caw! Or The Chronicle of Crows: A Tale of the Spring-time by RM, illustrated by J.B. It is a fun, lovely crow book. Lots of poetry with crows. This is well-worth the read. Try reading it aloud! =) If you dare, try reading it aloud AND recording it for me to post! =) I’d love that. Here are the first six pages… beautiful illustrations as well as fun poems. I will post the next six or so pages tomorrow. =) I hope you enjoy! The next part of this book will be posted tomorrow, so don’t forget to come back! CROWS, JAYS, MAGPIES, ETC. 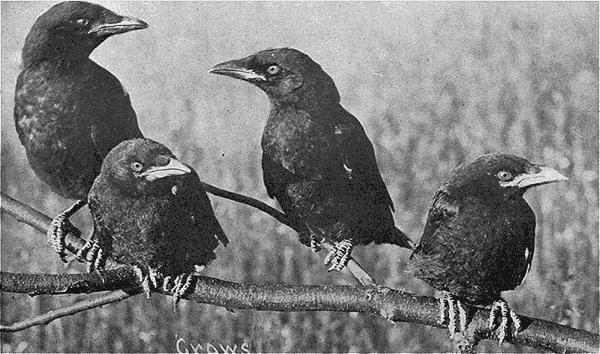 Family CORVIDÆ. 475. Magpie. Pica pica hudsonia. Range.–Western North America from the Great Plains to the Pacific and from Alaska to Arizona and New Mexico. These large handsome birds have the entire head, neck and breast velvety black, abruptly defined against the white underparts. The back, wings and tail are greenish or bluish black, and the scapulars, white; length of bird 20 inches. They are well known throughout the west, where their bold and thievish habits always excite comment. They nest in bushes and trees at low elevations from the ground, making a very large nest of sticks, with an opening on the side, and the interior is made of weeds and mud, lined with fine grasses; these nests often reach a diameter of three feet and are made of quite large sticks. 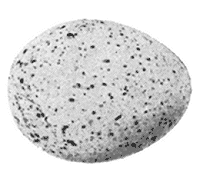 During April or May, they lay from four to eight grayish white eggs, plentifully spotted with brown and drab. Size 1.25 x .90. 476. 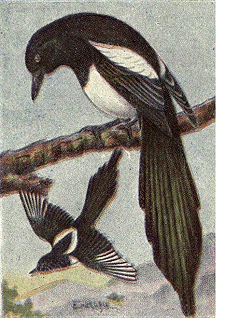 Yellow-billed Magpie. Pica nuttalli. Range.–Middle parts of California, west of the Sierra Nevadas. This species is slightly smaller than the last and has a yellowish bill and lores, otherwise being precisely like the more common species. Their habits do not differ from those of the other, the nests are the same and the eggs are indistinguishable. Size 1.25 x .88. 477. Blue Jay. Cyanocitta cristata cristata. Range.–North America, east of the Plains and north to Hudson Bay; resident and very abundant in its United States range. These beautiful and bold marauders are too well known to need description, suffice it to say that they are the most beautiful of North American Jays; but beneath their handsome plumage beats a heart as cruel and cunning as that in any bird of prey. In the fall, winter and spring, their food consists largely of acorns, chestnuts, berries, seeds, grain, insects, lizards, etc., but during the summer months they destroy and devour a great many eggs and young of the smaller birds, their taste for which, being so great that they are known to watch a nest until the full complement of eggs is laid before making their theft. They nest in open woods or clumps of trees, indifferently, in pines or young trees, building most often below twenty feet from the ground; the nests are made of twigs and rootlets, lined with fine rootlets. During May they lay from four to six eggs of a greenish buff color spotted with olive brown. Size 1.10 x .80. 477a. Florida Blue Jay. Cyanocitta cristata florincola. Range.–Florida and the Gulf coast. The nesting habits and eggs of this smaller sub-species are the same as those of the northern Blue Jay. Like our birds, they frequently nest near habitations. 478. Steller’s Jay. Cyanocitta stelleri stelleri. Range.–Pacific coast from southern California to Alaska; resident and breeding throughout its range. All the members of this sub-species are similar in plumage, having a sooty black head, crest and neck, shading insensibly into dark bluish on the back and underparts, and brighter blue on the wings and tail. They usually have a few streaks or spots of pale blue on the forehead. They are just as noisy, bold and thievish as the eastern Jay and are also excellent mimics like the latter. They nest in fir trees at any height from the ground and in April or May deposit their three to six greenish blue eggs which are spotted with various shades of brown. Size 1.25 x .90. Their nests are more bulky than those of the eastern Jay and are usually made of larger sticks and held together with some mud. 478a. Blue-fronted Jay. Cyanocitta stelleri frontalis. Range.–Coast ranges of California and Oregon. The nesting habits and eggs of this variety are indistinguishable from those of the preceding. The bird has more blue on the forehead. 478b. Long-crested Jay. Cyanocitta stelleri diademata. Range.–Southern Rocky Mountains from Arizona to Wyoming. 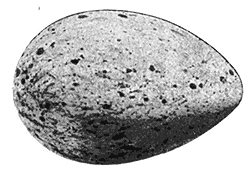 No general difference can be found between the eggs of this species and the Steller Jay, and the nests of each are constructed similarly and in like situations. 478c. Black-headed Jay. Cyanocitta stelleri annectens. Range.–Northern Rocky Mountains from northern Colorado to British Columbia. 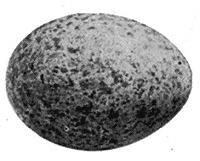 The eggs of this sub-species cannot be identified from those of the other varieties. Like the others, their nests are made of sticks plastered together with mud and lined with weeds and rootlets. 478d. Queen Charlotte Jay. Cyanocitta stelleri carlottæ. Range.–Queen Charlotte Islands, British Columbia. 479. Florida Jay. Aphelocoma cyanea. All the birds of this genus have no crests or decided markings, are white or grayish below, and more or less intense blue above, with the back grayish or brownish blue. This species is 11.5 inches long, has a pale blue crown and a nearly white forehead. It has a very limited distribution, being confined chiefly to the coast districts of middle Florida, and very abundant in some localities and rare in adjoining ones. They build shallow structures of small sticks and weeds lined with fine rootlets and placed at low elevations in bushes or scrubby trees. 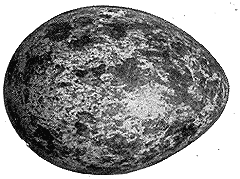 The three or four eggs, which are laid in April or May are dull greenish blue, marked with olive brown. Size 1.00 x .80. Data.–Titusville, Fla., April 17, 1899. Nest of sticks in a scrub oak, five feet from the ground. 480. Woodhouse’s Jay. 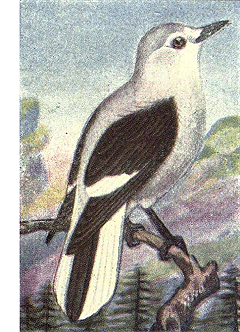 Aphelocoma woodhousei. Range.–United States west of the Rockies and from Oregon and Wyoming to Mexico. 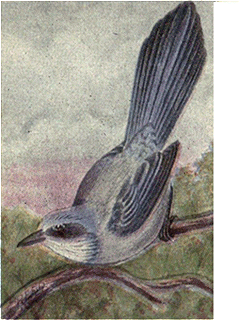 This species has the crown and forehead bluish, and the underparts gray, streaked with bluish gray on the breast. It is also larger than the last, being 12 inches long. They are very abundant in the Great Basin between the Rockies and the Sierra Nevadas, breeding during April or May in scrubby trees or bushes at low elevations and generally near streams. 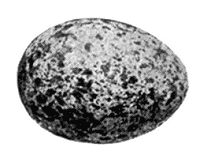 They lay from three to five eggs of a dull bluish green color, spotted with umber and lilac gray. Size 1.08 x .80. Data.–Iron County, Utah, May 3, 1897. 4 eggs. Nest of sticks and weeds in a small pine tree. Page 307 480.1. Blue-eared Jay. Aphelocoma cyanotis. Range.–Interior of Mexico north to the southern boundary of Texas. 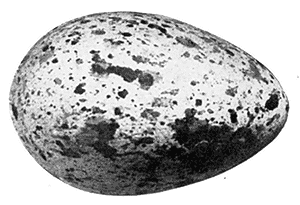 The nesting habits of this species are the same as those of the others of the genus and the eggs are similar but the markings are generally more prominent and larger. Size 1.10 × .80. 480.2. Texas Jay. Aphelocoma texana. It is not likely that the eggs of this species differ essentially from those of many of the others. 481. California Jay. Aphelocoma californica californica. Range.–Pacific coast of California and Washington. This is a very abundant species both about habitations and in low woodlands. They are very bold and familiar, stealing everything they may take a fancy to, and frequently robbing smaller birds of their eggs and young. They are said to be more tame and familiar than the eastern Blue Jay, thereby bringing their bad habits much more frequently to the attention of the masses. They nest most often in bushes or low trees, but not as a rule, far above the ground. Their eggs are a bright bluish green color, speckled and spotted with brownish and lavender. Size 1.10 × .80. 481a. Xantus’s Jay. Aphelocoma californica hypoleuca. The habits and nests and eggs of this lighter colored variety do not differ from those of the California Jay. 481b. Belding’s Jay. Aphelocoma californica obscura. Range.–San Pedro Martir Mts. Lower California. 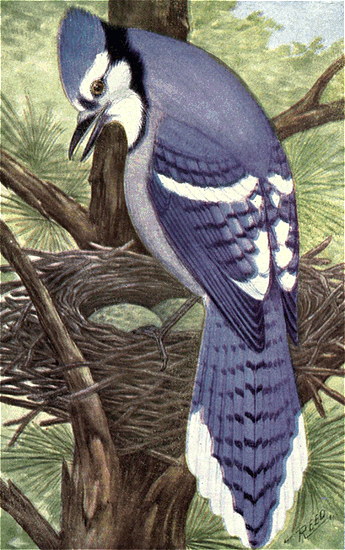 A darker variety of the California Jay, whose nesting habits will not differ in any essential particular. 481.1. Santa Cruz Jay. Aphelocoma insularis. This species is the largest and darkest colored bird of the genus Aphelocoma. It is said to be a very abundant species on the island from which it takes its name, and to have the habits and traits common to all the members of the Jay family. The nesting habits are the same as those of the others, but the eggs are slightly larger, averaging 1.15 × .85. 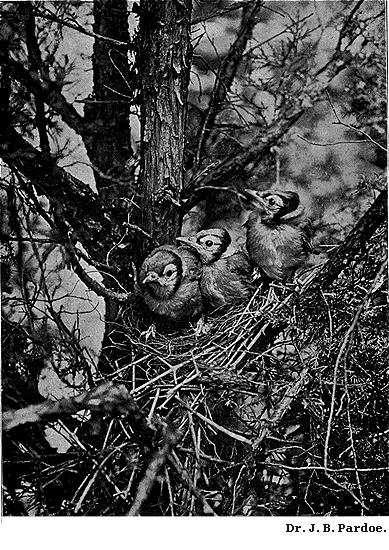 Set of three in the collection of John Lewis Childs, taken by R. H. Beck on May 10, 1897. 482. Arizona Jay. Aphelocoma sieberi arizonæ. Range.–Arizona and southwestern New Mexico south into Mexico. 482a. Couch’s Jay. Aphelocoma sieberi couchi. Range.–Eastern Mexico, north to western Texas. 483. 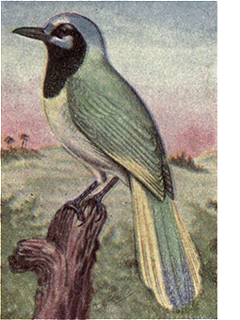 Green Jay. Xanthoura luxuosa glaucescens. Range.–Northeastern Mexico and the Lower Rio Grande Valley in Texas. This handsome species has a bright blue crown and patches under the eyes, the rest of the upper parts being greenish; throat and sides of head black, underparts greenish white. 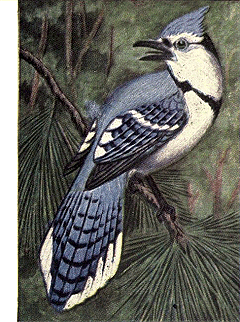 This gaudy and noisy bird has all the habits common to other Jays including that of robbing birds’ nests. They build generally in tangled thickets or low bushes, placing their nests at a low elevation and making them of twigs, weeds, moss, etc., lined with fine rootlets. Their four or five eggs, which are laid during April or May, are grayish buff in color, spotted with various shades of brown and lavender gray. Size 1.20 × .85. 484. Canada Jay. Perisoreus canadensis canadensis. Range.–Southeastern British Provinces and the adjacent portions of the United States; west to the Rockies. This is the bird that is well known to hunters of “big game” by various names such as “Whiskey Jack”, “Moose Bird”, “Camp Robber”, etc. During the winter months, owing to the scarcity of food, their thieving propensities are greatly enhanced and they remove everything from the camps, which looks as though it might be edible. Birds of this genus are smoky gray on the back and lighter below, shading to white on the throat; the forehead and part of the crown is white and the nape blackish. 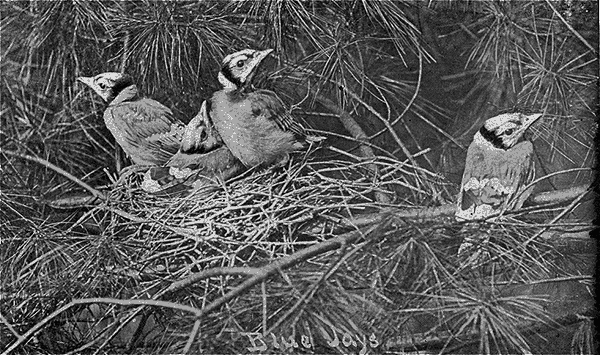 Their nests are placed at low elevations in bushes or fir trees, and are usually very different from any of the preceding Jays’ nests. They are nearly as high as wide, and are made of small twigs, moss, catkins, weeds and feathers making a soft spongy mass which is placed in an upright crotch. The eggs are a yellowish gray color spotted and blotched with brown and grayish. Size 1.15 × .80. Data.–Innisfail, Alberta, March 12, 1903. Nest a beautiful structure of twigs, moss and feathers in a willow bush, 6 feet from the ground. The thermometer registered 32 below zero the day the eggs were taken. Collector, W. Blackwood. Page 309 484a. Rocky Mountain Jay. Perisoreus canadensis capitalis.Range.–Rocky Mountains from Montana to Arizona.This variety has the whole crown white and only a small amount of blackish on the nape. Its nesting habits and eggs are precisely like those of the last. 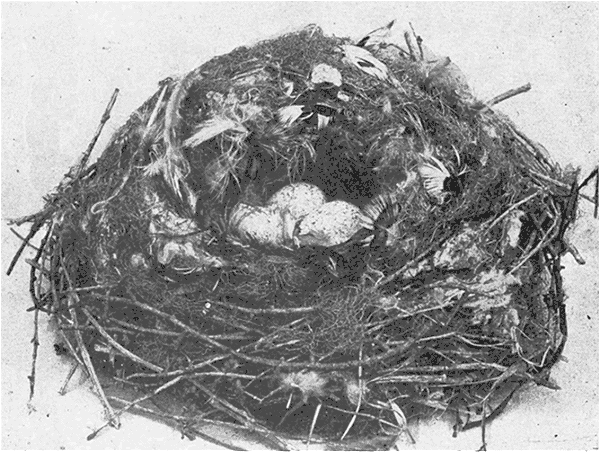 NEST AND EGGS OF CANADA JAY SHOWING CONSTRUCTION. 484b. Alaska Jay. Perisoreus canadensis fumifrons. A very similar bird to the Canada Jay but with the forehead yellowish or duller; the nests and eggs are like those of the others of the genus. 484c. Labrador Jay. Perisoreus canadensis nigricapillus. 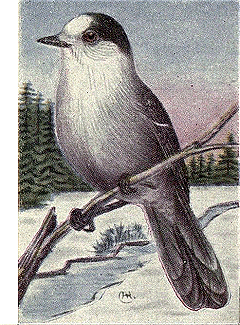 This is a darker variety of the Canada Jay. Its eggs cannot be distinguished from those of any of the others of the genus. 485. Oregon Jay. Perisoreus obscurus obscurus. Range.–Mountain ranges from northern California to British Columbia. These birds are very similar to canadensis but have the whole underparts white. Like the Canada Jays they appear to be wholly fearless and pay little or no attention to the presence of mankind. Their nesting habits and eggs are the same as the preceding except that they have generally been found nesting near the tops of tall fir trees. 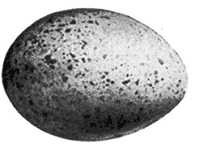 Size of eggs, 1.05 × .80. Page 311 485a. Gray Jay. Perisoreus obscurus griseus.Range.–British Columbia to northern California, east of the coast ranges.This bird is said to be larger and grayer than the preceding. 486. Raven. Corvus corax sinuatus. Range.–North America west of the Rockies and from British Columbia southward. The Raven is like a very large Crow, length 24 inches, but has the feathers on the neck lengthened and stiffened. Their habits are similar to those of the Crow, but more dignified, and they remain mated for life. Besides grasshoppers and worms, they feed largely upon animal matter such as lizards, shell fish, frogs, eggs and young of birds, and carrion. They nest on ledges of high inaccessible cliffs or the tops of tall trees, making large nests of sticks lined with smaller ones and hair or wool; the eggs are laid in April or May, number from four to seven, and are light greenish in color, blotched with umber and drab. Size 1.95 × 1.25. 486a. Northern Raven. Corvus corax principalis. Range.–Eastern North America chiefly north of the United States and northwest to Alaska; south on some of the higher ranges to Georgia. This variety is like the last but is larger. They are not nearly as abundant as the western form and are very rare within the United States. A few pairs still breed on some of the rocky islands off the coast of Maine; more off New Brunswick and Newfoundland, and they are quite common on the cliffs of Labrador and Alaska. Their nesting habits and eggs are like those of the last. 487. White-necked Raven. Corvus cryptoleucus. Range.–Mexico and the border of the United States; north to eastern Kansas. This small Raven is of about the size of the Crow, and has the bases of the neck feathers white. They are very abundant in some localities, especially in southern Arizona. Their food consists chiefly of animal matter, the same as the large Ravens, and they are not nearly as shy, frequently feeding in camps upon refuse which is thrown out to them. They build at low elevations in any tree, but preferably in mesquites, making their nests of sticks and lining them with hair, leaves, bark, wool or anything soft. During June they lay from four to six pale bluish green eggs, generally sparingly spotted or scratched with dark brown and drab. Size 1.75 × 1.20. 488. Crow. Corvus brachyrhynchos brachyrhynchos. Range.–Whole of North America south of the Arctic Circle; most abundant in eastern United States; rare in many localities in the west. These birds, against which the hand of every farmer is uplifted, are very shy and cunning; as is well known, they nearly always post a sentinel in some tree top to keep watch while the rest of the flock is feeding in the field below. 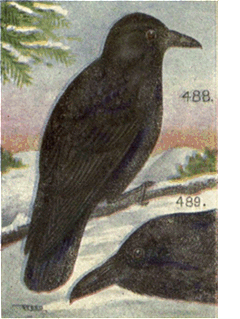 In the fall and winter, large numbers of them flock, and at night all roost in one piece of woods; some of the “crow roosts” are of vast extent and contain thousands of individuals. Crows nest near the tops of large trees, preferably pines, either in woods or single trees in fields. Their nests are made of sticks and lined with rootlets, and the eggs, which are laid in April or May, range from four to seven in number, are a bluish or greenish white, sparingly or very densely speckled, spotted and blotched with various shades of brown and lilac. Size 1.60 × 1.15. 488a. Florida Crow. Corvus brachyrhynchos pascuus. This variety has a slightly shorter tail and wings than the last. 490. Fish Crow. Corvus ossifragus. Range.–Northwest coast from Oregon to Alaska. This small Crow which is but 16 inches in length, is found only on the coast, where they feed upon shell fish and offal. They nest, as do the Ravens, either on ledges or in tree tops. The eggs resemble those of the common Crow, but are smaller. Size 1.55 × 1.05. 489. Northwestern Crow. Corvus caurinus. Range.–South Atlantic and Gulf coasts, north in summer to Connecticut. From Virginia southward, this small Crow (length 16 inches) is more abundant on the coast than the common Crow which is often in company with this species. Their food consists of grain, berries, and animal matter. Their nesting habits are like those of the common Crow and the eggs are similar and have as great variations, but are smaller. Size 1.45 × 1.05. 491. Clarke’s Nutcracker. Nucifraga columbiana. Range.–Mountains of western North America from Mexico to Alaska. The Clarke Crow, as this bird is often known, is a common resident in most of its range. The adults are grayish with black wings and central tail feathers, the tips of the primaries and outer tail feathers being white. Their tail is short and their flight slow and somewhat undulating like that of some of the Woodpeckers. Their food consists of anything edible from seeds and larvæ in the winter to insects, berries, eggs and young birds at other seasons. 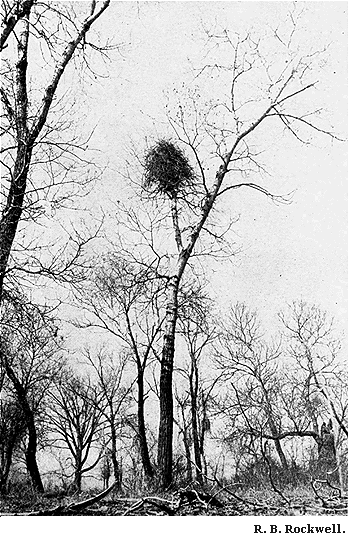 In the spring they retire to the tops of ranges, nearly to the limit of trees, where they build their large nests of sticks, twigs, weeds, strips of bark, and fibres matted together so as to form a soft round ball with a deeply cupped interior; the nest is located at from ten to forty feet from the ground in pine trees and the eggs are laid early before the snow begins to leave. They are three in number, grayish in color with a greenish tinge and finely spotted over the whole surface with dark brown and lavender. Size 1.30 × .90. Data.–Salt Lake Co., Utah, April 25, 1900. Nest placed in pine 40 feet up on a horizontal branch, and not visible from below. The tree was at the upper edge of a pine forest at an altitude of about 3000 feet above Salt Lake City. The nest was discovered by seeing the parent fly into the tree; the next day a nest was found with three young nearly ready to fly. Collector, W. H. Parker. This set of three eggs is in the oological collection of Mr. C. W. Crandall. 492. Pinon Jay. Cyanocephalus cyanocephalus. Range.–Western United States between the Rockies and Sierra Nevadas, and from southern British Columbia to Arizona. This Crow-like Jay has a nearly uniform bluish plumage, and is found abundantly in the pine belts of its range. Their habits are similar to those of the Clarke Crow and the nests are similarly built at lower elevations in pines or junipers. During April or May they lay from three to five eggs of a bluish white color specked and spotted with brown. Size 1.20 × .85. Till he made a little Garden. March is National Real Aloud month and so, I will do just that—read aloud. I will read aloud and record a story for you. It is public domain provided by Project Gutenberg. As you may have noticed by the title, it is crow related. =) And so, grab a cup of tea, sit back and turn the volume up and listen to a story. I will include the pictures as well! =) I hope you enjoy it. And improved his little Garden. Of Johnny Crow and his Garden.